We went back to Alki Beach to shoot our June cover because the setting was perfect for our first month of Summer. We also liked how the colours of this outfit worked with the pebbled beach. This does not look much like a Summer outfit. But for me, who feels cold at the drop of a hat, and for Seattle, where the days in June are mild at best, it’s a very comfortable combination. Lightweight, layered, light coloured, bright, and ever so slightly relaxed. 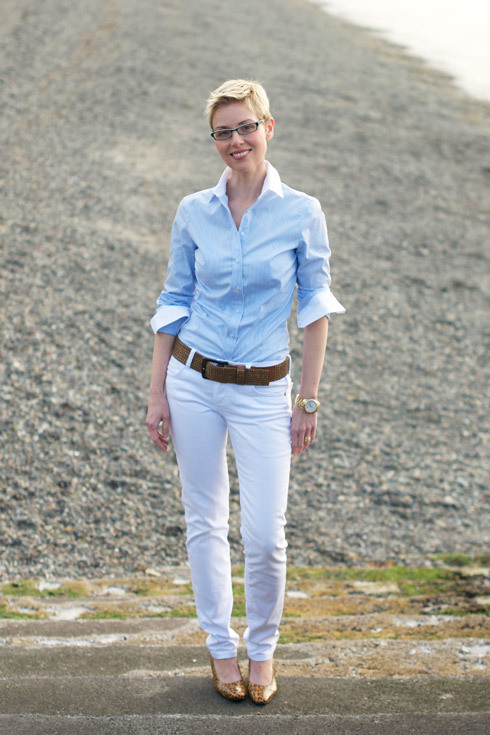 White jeans aren’t everyone’s cup of tea, but I love them and wear them every year. I don’t think I have ever not had a pair of white bottoms in my wardrobe. To my eye, they add a crisp, modern freshness to an outfit that screams Summer. 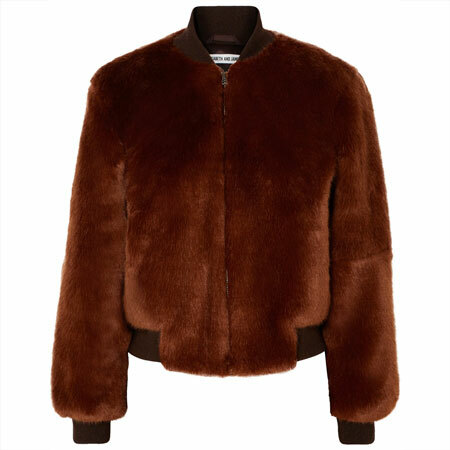 They also provide the right amount of warmth when it’s still too cold to wear cropped lengths. I usually match white jeans with black, ink blue or bright tops both in solids and patterns. This year, as a nod to the pastels trend, I fell back in love with light blue paired with white. I used to wear light blue quite a bit in the ’90s, so it’s been fun incorporating a past favourite back into my style. I’m really into wearing menswear inspired button down shirts complete with starched white cuffs and collars at the moment. So when I saw the item offered in shades of light blue, I snapped up a couple of variations. This shirt has a fine blue and white pinstripe, which I like to wear with white jeans. I scrunch the sleeves so that the white cuffs are visible and let them fall freely around my forearm. I tuck in the shirt for a more masculine look. A classic, clean cut, cotton blazer adds to the manly vibe of the outfit, while the bright citron colour adds a little fun. I paired a chestnut studded belt and low heeled animal print pumps to match up with the light tortoise shell buttons on the blazer. I finished off the look with a cream satchel because I like mixing up different whites in the same outfit. White rimmed specs with blue inners, gold watch and wedding ring are the finishing touches. This outfit represents my style for Summer 2012. Simple, clean cut, crisp, modern classic, a little masculine, a little soft, jewelry-free, and quite bright. Now please send us your hot sunny weather so that I can wear clamdiggers with blouses and not whine about the cold. I always love the look of a button down tucked into jeans with a wide belt and this is fresh and cool perfection. The citron jacket with the light blue and white is out of this world. Gorgeous! You look so, so drop dead gorgeous in this outfit. I love the crispness and the perfect fit of every piece. The blouse fits you really well. I noticed you went for a closer fit. I happen to like this fit a lot as well. Such a beautiful outfit Angie! I love how you can wear button down shirts tucked in. The colors are beautiful together and so are the shapes. I am inspired to try something similar with my emerald blazer. This must be one of my favorite Angie’s outfits! It is very simple and in the same time very interesting and uniquely you. 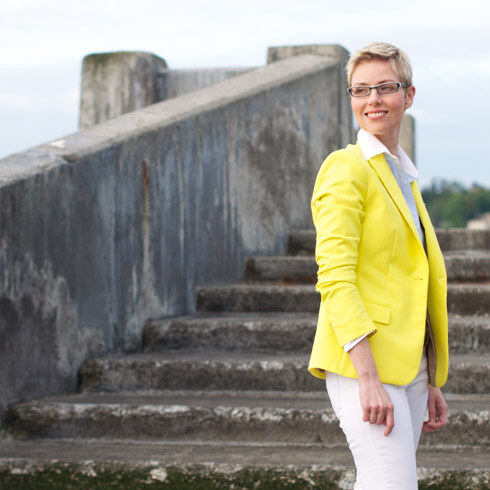 I am happy to see the yellow blazer in action at last: I missed the moment when you bought it in Macy’s and was itching to see it. Did the nasty ink stain come off? A perfectly chic outfit for a very chic woman. Love the crisp and clean lines. Oh Angie, this outfit is so beautiful on you! Now I want some cool weather to wear a similar look. Like sveta all I can think of is the ink stain. I hope you have been able to rescue the blazer. Yes the pale blue is a new colour for you Angie but it is still very clear in saturation and perfect for your wardrobe! Thank you for the inspiration. You are so sharp and just a bit prep school in this outfit, except for the citron. I also love mixing whites. The colors in this outfit are similar because they are mostly light tones, the variation comes with the brightness of the citron, just the right amount to keep things in balance, repeated again with your hair color. White is a great neutral with bright color, as is black. they both have a punch. Off white does not work as well, IMO. Off white or cream works better with softer color. That is of course, very subjective but works with painting. You often see paintings with black, white and 2 or 3 high saturation colors but always bright white. I MUST copy this look! Loved! I have the jeans, I have the white skinnies.. I want a yellow blazer!!!!! This would work so well with our office environment. Pinning it!!! Perfect, Angie. I love the mix of summery colors in this outfit. I adore blue and white together for summer, and the addition of citron is unexpected and totally works. I love how this is simultaneously crisp, but also cool and soft. I always love your citronesques outfits, Angie! :-) This is another perfection! Love the light blue to this color combo and noticed the jacket has a beige lining which screamed for the brown belt and animal shoes, indeed:-)). I absolutely love your style for Summer 2012! So fresh, simple, and modern. I looooove this look and want to copy it ASAP. Were you able to get the pen out of the blazer? I hope so…. You look gorgeous Angie. The button down looks great and is so “you”. And the citron is such a beautiful color with the blue and white. I appreciate the idea of mixing whites and find the concept quite liberating and it seems to be a simple way of adding a subtle point of interest. Hope the jacket has survived the stain. Super Chic, love that to the max!!!! I wondered about the jacket, have you managed to save it?? Such a great outfit — love it! Lovely! I will send you some of our warm and humid weather post haste! Beautiful and very Angie! I hope you managed to save the blazer then. I will trade you our weather – I want to wear my boots! Perfectly put together, polished and pretty! YLF! This IS a prep school uniform. For Angie’s School of Sunshine!! You make it bright even on a grey day. What a gorgeous outfit. And so beautifully polished. LOVE that shirt on you. It is spectacular. I hope the jacket has recovered?? Crisp, clean, strong! I love that the simplicity allows the color and cut of everything to really shine. The studded brown belt is an unexpected touch. Love the pairing of the cream bag with the crisp white jeans and collar/cuffs. You wear menswear-inspired looks like no other! So glad that the beautiful jacket is out of sick bay :). I love this, Angie! It is so crisp and fresh looking. The colors are gorgeous. I’m anxious to hear about the fate of the jacket as well. I hope you were able to get the stain out! Drop dead gorgeous is indeed the word(s) for you and for this outfit.I had never tought of combining menswear with soft but you make them in such a beautiful way . I hope that jacket could be rescued. This is one of my favorites! I love the crisp white paired with the button down shirt and bright jacket. And then the belt and shoes! Fabulous! You are giving me ideas about my white pants. Seems like every month you post our NEW favorite outfit! Always such a treat and love hearing your thinking as to putting it together. Thanks so much for the lovely compliments, ladies. I’m blushing and humbled to have inspired a few of your own outfits. As for the ball point pen mark on the lapel. Well. Most of it is gone, to the point that I am wearing the blazer and just not thinking about it’s tiny scar. I ended up using milk, hairspray and washing it in the washing machine on the hand wash cycle because the hairspray and milk stained the jacket. The laundry cycle did the jacket a world of good actually! Zap, you are right. This shirt is more fitted than my Brooks Brothers button downs. Tucking it in also makes it more fitted. Lyn67, you have a good eye. The lining of the jacket is a tan and white pinstripe. Greenglove, thanks for the applause :). I agree with your assessment of how best to mix white and off-white. Love hearing your artist’s eye in all of this. Diana and Janet, I hope you expedited the weather overnight. That would make me really happy! Jonesy, fit becomes even more important when you have a simple, modern and minimalistic style – because it’s the main thing that you see – don’t you think? Thanks so much for the menswear look compliment. I am delighted to hear that. Angie, you keep posting these super fantastic outfits that I know would look great on my DD. I’m going to have to pin all of them. The one you posted this time has a refreshing look to it, and the yellow jacket is fab. Beautiful, perfect outfit! The blouse is gorgeous. Is it the one from BR? I just ordered a few button downs and am anxiously awaiting them. I adore the blue, white and yellow together. It is just lovely! Pinning…..
What a great outfit combination when your weather is still cool. You are all covered up, but in light and bright colors to salute the season. You have worn three things I’ve been wanting to see you in: the blue and white shirt with white collar and cuffs, the famous yellow blazer, and white jeans, which I’ve never seen you in before. I wish my white jeans fit me as well are yours fit you! You look terrific! I’m blowing a kiss and a heat wave up your way. Wow Angie – so gorgeous – clean, crisp, and summer cool. You just inspired me with 2 new summer outfit ideas for myself. Thank you. I really love this look on you, Angie! I’m inspired by the way the button-down fits your body so closely. Did you have it tailored, if you don’t mind my asking? Oh, and pinned for inspiration! Very nice! I love your starched collar and cuffs. I also like how your pants are quite low on your hips, and you’ve got the shirt tucked in but it doesn’t look boxy because it fits your waist very closely. I’ve tried that look too but none of my shirts go in at the waist enough. I’m thinking I might get a shirt and have it taken in a bit at the waist so that I can try tucking it in. Angie, you look gorgeous. This is one of my favorites. I have always loved blue and white together and the collar and cuffs on that blouse are fantastic. Love the pop of color with the blazer. Too chic! I like the look of a tucked i blouse with a belt. However, with low rise pants, I find that there is too much blouse at the waist line and I end up losing my shape. Your shirt looks like it is tapered. Is it stretch? Do you have any tips about not losing your waistline with a tucked in blouse? 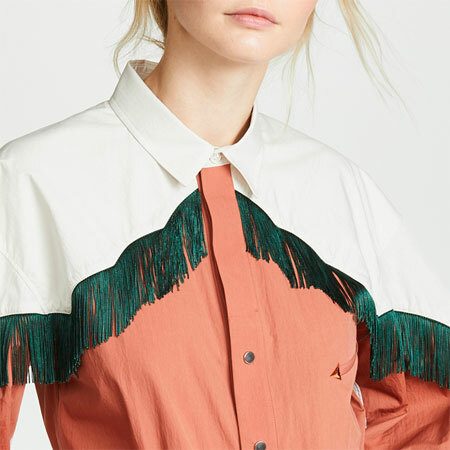 Do I need to add darts to all of my blouses? I LOVE the blue top & the whole outfit – very structured & classic. Thanks for the kind words, ladies. You have brought sunshine to our grey Seattle day. Meredith, this is a Zara button down shirt. Thanks, Claire! I thought of you when I wore this shirt with my white jeans. Elisabeth, Elbe and Shu, I did not have this shirt tailored and it is NOT stretch. It fit just like this straight off the rack. It has a great shape and I got lucky. Not too tight – but very tailored. The tailored effect works well when tucked in with low rise jeans as you pointed out. It might be worth tailoring some of your own shirts if you want to tuck them into low rise bottoms too. SO FAB, Angie!! I love this look! And I can’t help but be tickled that you and I have some similar pieces — studded belt, white jeans, leopard pumps! BIG FUN!!! Just had to chime back in to say I’m sooooo glad that your jacket survived its trauma and will continue to be worn and loved by you! Love!! the belt and shoes! And the bright pop of color! It’s the sheer simplicity of this look that I love most of all! Such a sunny and summery combination – menswear with a distinctly feminine flair. I love how you take some very simple pieces and put it all together in a modern way. I’m LOVING that shirt. I really like button-ups with contrasting collars/cuffs and that one is absolute perfection! Yay! The jacket is back! You knew I would love this post – I am very much into the entire look. I think my favorite part is the chestnut additions to the otherwise very bright colors. I also like how you tuck into skinnies – something I don’t really do myself, but now it is on the brain. One of these days I’ll find the perfect white jeans! Is this the same yellow blazer you wore to the clothes swap? It looks different (the color looks softer) but maybe that just goes to show how versatile items can be and look different in different outfits. Of course what I love best about this outfit is that you’re topping it off with cheetah print shoes! LOVE the look! I’m to steal it (with a little twist)! Thank you Angie for sharing. Yummy! I love the lemony zestiness (is that a word?) clean, crisp, refreshing. I’m going to rethink white jeans, they just look so refreshing. I love seeing your yellow blazer in action once again and we probably gave you one too many “natural” cleaning remedies for it! You look summery in your white, light blue and yellow combination and adding the cream bag, studded belt and shoes puts a happy Angie face on the Seattle sunshine! I’ll send a few more sunbeams your way from Southern California. I’m a huge fan of white jeans, and like you, have a pair pretty much at all times. I love how you did a nod to the pastel trend without actually wearing pastels. Brilliant. You always look fresh and crisp and this is no exception. Can’t believe that shirt fit so well off the rack. Lucky, indeed. Here’s hoping for sunny, warm days ahead for you! Great outfit, Angie! Those colors are so pretty on you, and the crispness and tailored fit are perfectly your style. Lovely! I love your summer 2012 look so much. I have always felt more myself in a boyish or masculine sort of look and I am really enjoying seeing your examples. I’m also love the simple accessories. This is my kind of look, if, I could find the pieces to fit me in all the right places and be long enough. I wanted to add that the way you’ve added a more feminine shoe looks great. I’m afraid I may have made the mistake of low boots or oxfords and it would not be nearly as nice. Also love your outtake pictures! Oh WOW, such a gorgeous look! The blouse is lovely, I adore the contrast cuffs and collar. This type of low-contrast and very light color palette really really appeals to me, one of my favorites for spring/summer. And even with the citron blazer the overall effect remains low contrast but bright. The accents of brown also keep the overall look much softer than black would have, and I quite like the bit of earthiness they add to the look. I wore this formula heavily last spring and into fall, and haven’t done it as much this year so far. But this is such an inspiring outfit I shall have to go back and give it a go (it used to be a signature look for me!). I have been thinking hard, in light of my move to softer dressing, where my beloved button-up shirts would fit in… And this is a great example of working them to get soft VIBE and COLOR. I had been hesitating to purchase a few more stiffer button-ups because of that, but not any more! So pretty! I love the fresh and crisp vibe of this outfit. I love white jeans and badly need one for maternity. Your bag is also divine! BTW: Is this the blazer you had a pen mark on? Was it saved? Hope it was. XO! Oh! Thanks so much for the compliments. Antje, you are right about button downs making a fashion statement at the moment. A look close to my heart! This is the same citron blazer that you saw in real life. It’s a little iridescent so the light is catching it differently in these photos. Thanks for sending the sun our way Vicki and Mo! Aida, glad to have inspired the button down vibe for your style. Angie, you are so adorable! I got such a kick out of seeing you hamming it up in the Facebook photos. This is a fun jacket and it’s good to see you having so much fun wearing it. I love this look on you – you look great in light blue! So happy to hear that the jacket is not ruined. This was really interesting because I wouldn’t have identified this look as masculine, but when I read your explanation, I can see it. I also love light blue shirts. It’s one of those things I just keep buying. You look absolutely fabulous, and I always love your detailed explanations because I always learn something from it. 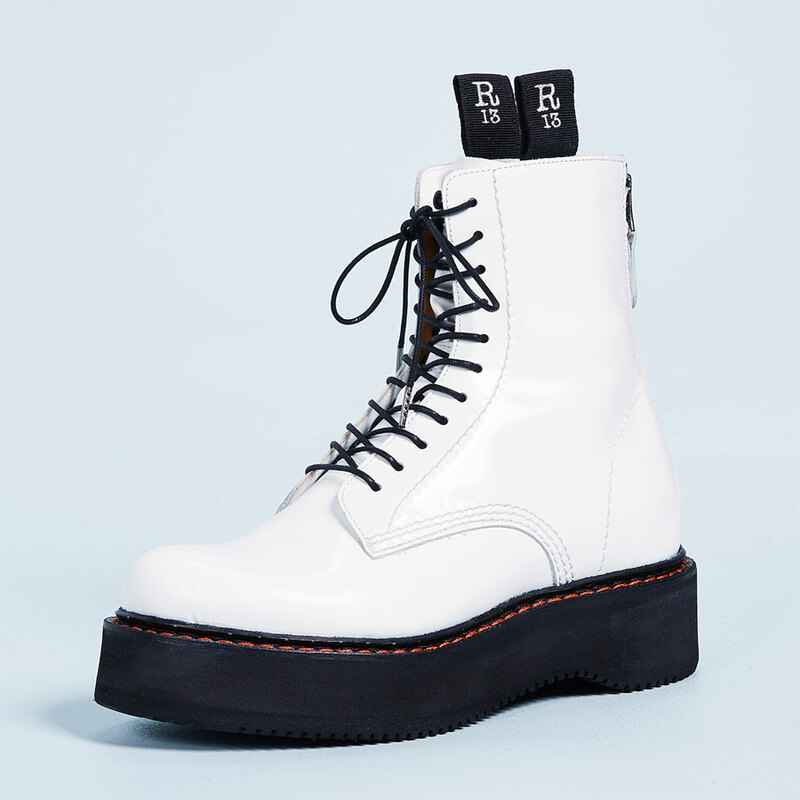 So interesting for example about the buttons, belts, and shoes. 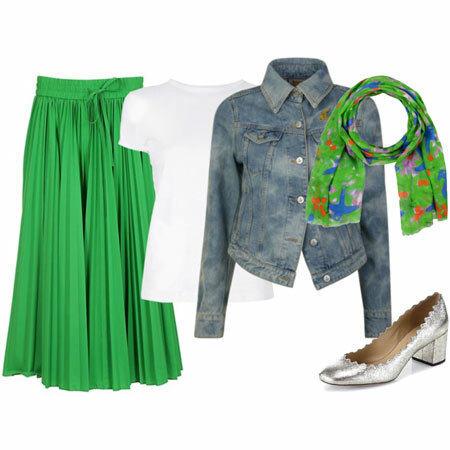 This is a very successful outfit for you because it brings out your femininity, which comes out strongly here. The masculine clothes only underline it even more by contrast. Also somehow, this outfit disappears to let you shine. I think a winning component is crisp, close to the body lines. I mean, you really have the perfect body for it too! I like the preppy details such as the belt too. It’s a perfect outfit for the NW! Bright colors and white jeans are perfect to stay warm when the weather and the seasons are not cooperating. I adore my white jeans in the spring months because it says spring to me but still keeps my legs warm. And bright blazers are a fun twist on a classic look. This yellow paired with the soft blue is superb! 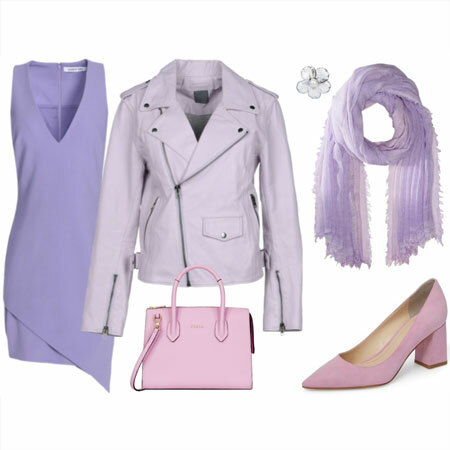 Gorgeous outfit – those colors are perfect for summer but the coverage is perfect for Seattle. And I love how the lighting warms up the grey tones in the photos. Mamavalveeta, I hope you go back for the blue shirt. Golddenpig, if menswear inspired outfits aren’t working for you – stick to your fab lady like style! DROP DEAD GORGEOUS and so cool effect your outfit is giving in this hot summer here. My blue day today is lightened up by your outfit. And I am envious of your hour glass slim figure………Love that shirt color and that belt. I need to have some white jeans in my wardrobe now. I love the whole outfit and you in it. Fashionista, thanks for your awfully kind words. I hope that you get a pair of white jeans too. Angie, This outfit is gorgeous. Seeing you rock this outfit and some other YLFers, I am starting to realize that i am a big fan of masculine vibe. The button down shirt is so pretty and fits so well. I can’t remember if I posted to say how much I like this or not and can’t see a comment so assume I didn’t! So, yes, I love it but the comments from Jonesy and Greenglove particularly make me realise how hard it is to get something like this ‘just right’. This looks lovely on you Angie – soft colors, cool yket polished, just perfect for the Seattle summer. I would have to wear a sleeveless button down, airy sandals and a lighter weight white pant here, but I am thinking of ways to copy this look for 95+degrees right now! Great inspiration! I don’t think I got my comment posted earlier, but this is another amazing Angie outfit. I was inspired by the color combination to pair white jeans with my white button-down BB shirt, collar and cuffs out, and to top it with a faded-to-pale-blue cropped jean jacket from Nordstroms BP dept. For the citron, I only had a bright yellow bag. Shoes were animal print loafers. It wasn’t the pristine look you are wearing, but I loved the white with pale blue for a change. Thank you for continuing to inspire us. I love love love this look. Do you think there is any way to wear button shirts that don’t look frumpy with my body? Joy, your outfit interpretation sounds wonderful. I hope that we see it on the forum. Soft and pretty for Summer. Meredith, of course! Try the non-iron shirts at Banana Republic as they are quite tailored through the torso. Texstyle, I like the way you adapted my outfit to suit your climate. OK! I’m going to give it a go!! Love this look so much! Keep me posted, Meredith! Wear a cami, unbutton under the bust and wear a fitted size. I have nothing new to add, but just wanted to say that I love this look to bits, from head to toe. So crisp, simple, strong and absolutely gorgeous!! Stunning!! This is definitely a look of inspiration. This would be great for the office with the air conditioning. So glad our jacket is saved!! Thanks so much Inge and Debbie! I think you both might like wearing light blue and white button down shirts too. Ok! I’m going to try this for summer! If there is a “scar” from the pen mark, I can’t tell. I love how the citron & pale blue look totally different from the citron & gray/black/white print blouse, but still work very well together! So glad that the wonderful blazer was saved. I’ve been searching the net but can’t find a jacket like this. Can you tell me some good brands to check out? Melsreturn, you can leave the sleeves of the Gibson jacket down or rolled/scrunched up.